Note that this equation estimates a mass value tending to infinity when the speed tend to the speed of light. 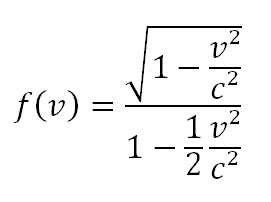 Unlike the Einstein relationship, this equation allows to calculate that the value of the radiant mass, ie the mass which travels at the speed of light, is exactly equal to twice the value of the rest mass. Introducing the possibility that the electric charge can depend on the speed (as the mass) opens a series of very interesting considerations. where f(v) is a function of the speed and it is reasonable and convenient to think that it is equal to 1 when the speed is zero (classical extreme) and 0 when the speed is equal to c (relativistic extreme). Note that up to a speed equal to 30% of that of light (v/c=0.3) the difference between the value of the relativistic electric charge qr and the rest charge q0 is extremely small (qr/q0≈1). The introduction of the relativistic charge allows first of all to explain in a classical way why mass seems to stretch to infinity when approaching the speed of light. 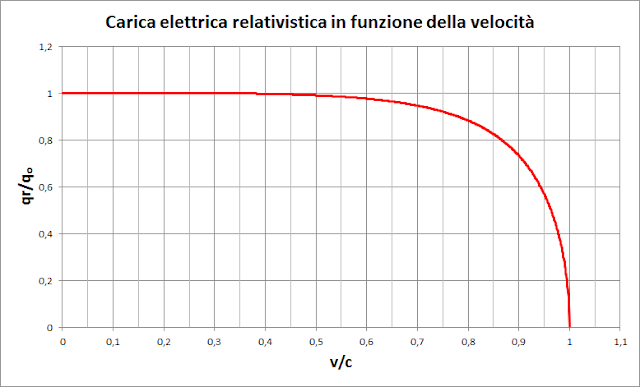 Since the acceleration is equal to the ratio between strength and mass and since the force is equal to the product of the electric field by the electric charge, in the assumption of constant electric charge and therefore constant force, the decrease of the acceleration in constant electric field could be explained only by a mass increase. Now, having opened the possibility that the electric charge depends on the speed, the electrical force becomes weaker and weaker as the speed increases because the electric charge tends to fade. Therefore it is no longer necessary to say that the mass tends to infinity to justify an acceleration tending to zero. 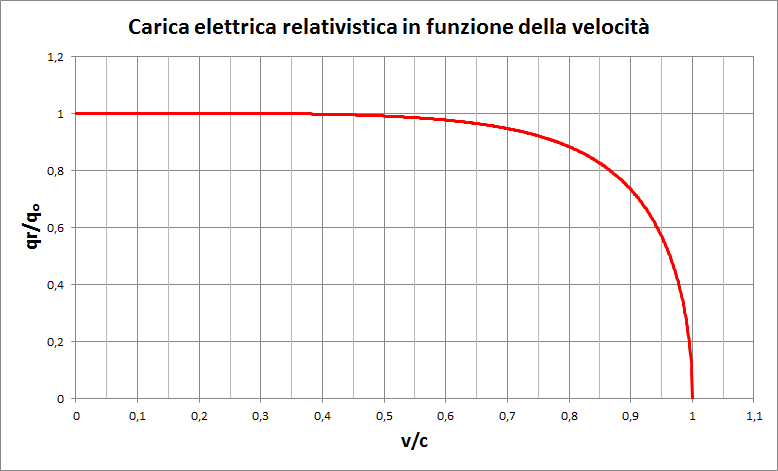 Furthermore, since the electric charge is canceled at the speed of light, it is impossible to cause further acceleration because the force is zero. In this way it is explained why the speed of light is an insurmountable limit. In addition to this, it should be noted that the cancellation of the charge when the speed of light has reached makes more acceptable and credible the possibility that the matter traveling at the speed of light is completely converted to electromagnetic radiation as it is respected the neutral electric charge of photons. An experiment that could resolve the doubts and bring confirmations to the relativistic electric charge is to verify if the electron may or may not be to an energy greater than 511keV. Based on the above, this energy is the threshold value for the electron. The electron can not be accelerated further as at this energy it reaches the speed of light and its electrical charge should cancel. In this hypothetical condition the electron should be effectively a photon at 1022keV (in which half of the energy comes from the rest mass and the other half was provided accelerating it). If this is real, it is no longer possible to slow it down by means of an opposite electric field restoring a state of electron with speed near to the speed of light and it would be the first experimental demonstration that matter can really convert to electromagnetic radiation.